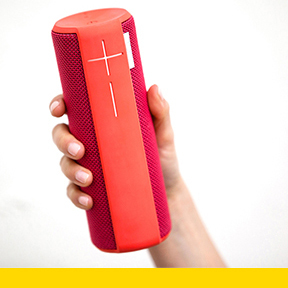 The Ultimate Ears Boom Wireless Bluetooth Speaker The Social Music Player is a durable, water-resistant speaker. The plus/minus interface is refreshingly simple and makes it easy to enjoy a social music experience. The attention to detail extends to the charging solution: a flat cable that avoids twists and easily rolls up for tangle-free storage.